Part of being a starving artist has included giving up cable television in the last few months. I have never been all that attached to TV but I have been surprised by what I find myself missing. The shows winning Emmys are not on my list. Admittedly, I always liked the show “Hoarders.” Give me the A&E version or even it’s TLC rival and I am set. I love watching the family dynamics unfold as the hoarders defend their material belongings. Hoarders seem to come in two varieties. The Poor and the Traumatized. The first group hoards stuff because they feel insecure having once had to go without. My Mom fits this “Hoarder” mold in the sense that she grew up in abject poverty and is therefore unwilling to part with what other people would consider “trash.” she has in recent years furnished a vacation home entirely with materials she already had- she literally had a second house worth of stuff waiting in the wings. Mom thought she was pretty much genius for not having to buy a thing. “That’s the point of keeping everything,” she has proudly said. It’s perfectly reasonable in that sense but also in direct conflict with our consumerist culture’s binge and purge cycle. Hoarders do great on the acquistion side of the cycle, but less well on the letting go part. Although, hoarding makes some sense on a bioevolutionary level. 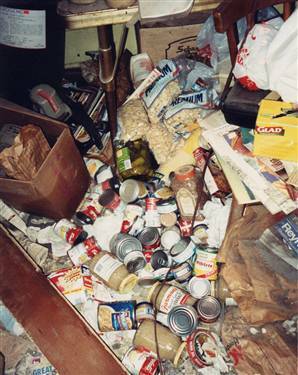 One might think Hoarders may be better off were an apocalyptic scenario to unfold. They’d have more stuff at least, assuming it’s not one of those really filthy situations in which most of the stuff is totally unusuable anymore. I admit to a lingering paranoia of my own, in which right after i’ve cleaned out my car of things like empty water bottles and fast food silverware I think, what if I now get stuck in some sort of disaster (an avalanche? an earthquake? lost in the desert?) and the supplies I am restricted to are the items from my car? Bear Grylls has traumatized me. Wouldn’t I be sad to have tossed that silverware then? Speaking of trauma,the other half of the Hoarders start collecting stuff to fill some emotional hole left after someone dies or leaves or robs them at gun point. I think those are the sadder situations but the “Hoard” usually looks identical. Did that noun always exist btw? Or did reality TV create it- “the Hoard!” I question the shows’ propensity for forcing these “trauma-driven Hoarders” to confront whatever ails them. I saw one episode in which the camera followed one lady back to where her life had been threatened. As she looked visibly shaken and began to weep, I thought, hmm, if her current coping skills consist of rabid retail therapy are we sure this is safe for her? Not retraumatizing perhaps? I felt similarly overprotective watching an episode in which a mother whose baby died in infancy was encouraged to let go of her now molding baby clothes. I thought if I had a baby who died, good luck prying those onesies out of my hands. Why shouldn’t she get to keep at least one? The therapist argued that tattered clothing wasn’t a great representation of her daughter’s memory. In the confines of my living room I argued that sometimes that’s the best you’ve got. Material belongings are a poor subsitute but they’re something. Maybe i’m a Hoarder in training, one trauma away, look I’m already attached to my television.